I can’t believe I’m saying this but the 2019 Dynamic DC Calendar is here! Above is the cover but if you want to see the rest of the calendar, click here. I always try my best to avoid saying this because it’s so cliche but I can’t believe it’s already almost the end of 2018. It seriously flew by and quite possibly one of the best years ever! 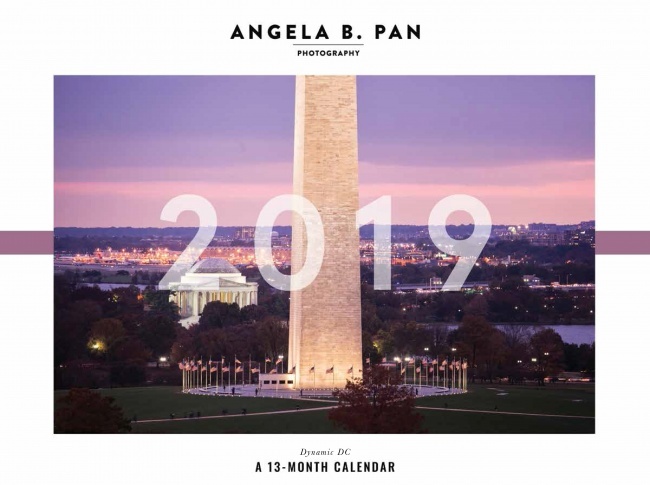 As I was curating and putting the 2019 Dynamic DC calendar together it brought back so many wonderful memories. 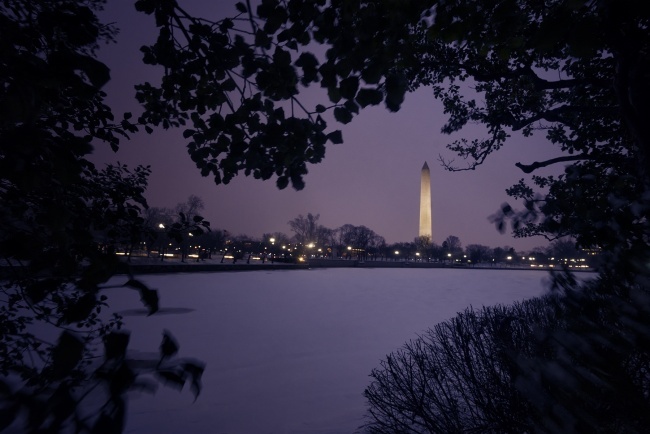 Like, do you remember the second day of spring and we finally got our first real snow fall in the Washington DC area? That’s the image for February 2019! Or those awesome lightning storms that we got in May? The ones that I captured at the US Capitol are some of my all time favorite lightning shots I’ve ever created. That’s the image for August 2019! By the way, August always has my favorite image of the year since it’s my birthday month. LOL. Or even hanging out with my friends, Jarrett and Brandon at the Tidal Basin in the fall and photographing the cherry blossom trees when the leaves had all changed colors. That’s the October 2019’s image. So if you’re interested in picking up a calendar, they’re on discounted pre-sale now. The sale will only last til November and will go back to regular price after that. Click here to purchase. They will make great holiday gifts for anyone who lives or just loves Washington DC. Special shout out to Leigh from Savage Design Co who helped me create the calendar and more importantly the cover this year. I love it! Days have been going by so fast lately. Don’t you think? Or is it just me? Even though the days are longer, I swear I wake up in the morning and the next thing I know it’s 2p. If I really thought about it I think I took this image this past weekend but when I looked at my calendar, it was really from three weeks ago! That’s so crazy. I captured this image at the IGDC sunrise meet up. It was a super cold morning and with no clouds in the sky. Usually those are the kind of days that I would rather sleep in (and by sleeping in I mean sleeping until 7a on a weekend) but I knew I would have had a great time shooting with my friends. I left my camera in my backpack for the most part. I was enjoying the conversations more than anything else. 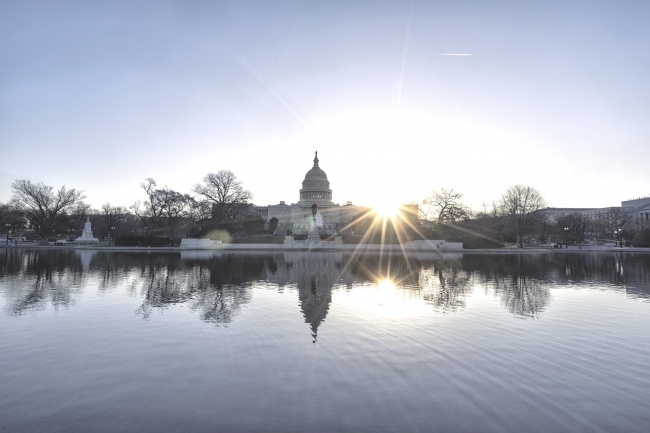 But as everyone was wrapping up and leaving, I noticed the sun burst peaking out of the US Capitol building. So I shot it and didn’t really think much of it. It wasn’t until I got home and looked at the images on my computer did I realize I captured the reflection of the sun burst. How freakin’ cool is that? Now that I think about it, I think it would be even cooler if I got some seagulls or something flying in the image and got a reflection of that as well. It would be really nice to have some kind of foreground element to this image. Oh well, there’s always next time. I’ll just have to keep that in my to-shoot list. The camera settings for this image is F/22 at 1/50th of a second at ISO 200 with my Sony A7II and 16-35mm wide angle lens handheld. But I was still able to make it out with my friend, Paul. We walked all around the National Mall and I was trying to find some new, interesting compositions that you can only see in the snow. I love how snow changes a scene. For this image, I was all the way tucked into a little tree cove but I think the most interesting part of this image are the lights coming from the street. It sort of reminds me of morse code. Like the cars and street lights are saying, “more snow, more snow”. My only wish for the rest of winter is that we get one really good day of snow and I’d be happy. Then it can all melt away and I will run with my arms wide open to welcome in spring. Cherry Blossoms, where you at? Am I the only who feels like this or can the week between Christmas and New Years eve feel really slow and sort of like a blur? Like you have no idea what day it is anymore or even what to do with yourself? I don’t know it’s felt like that for me in the past couple of years so this year I told myself I wasn’t going to do that anymore and remain productive during the week. That started yesterday, the day after Christmas when I woke up to take sunrise pictures. I woke up and checked my weather app and it said it was 26 degrees and cloudy. I don’t know about you, but that doesn’t exactly get me excited to wake up but I told myself that I was going to do it the day before so I did it. Oh man, it was so worth it. The sunrise was beautiful! One of the best ones I had seen in a while. 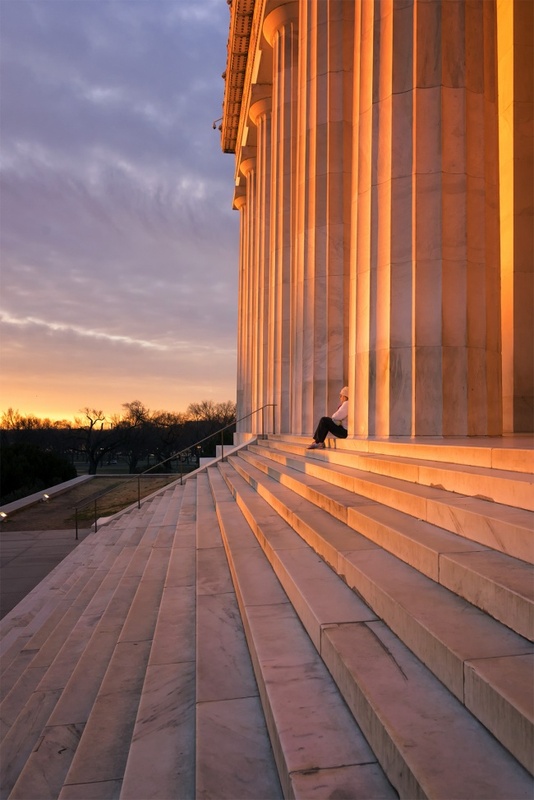 But the best part was when the sun was already up and that early morning glow hit the the Lincoln Memorial. The memorial doesn’t glow like that at any other time of day but sunrise. I love how it makes the memorial look orange. I was in the middle of walking down the steps when I turned around and saw this lady enjoying the sunrise as much as I was. I had to stop and take pictures. She had to have known I was taking pictures of her because we basically had a whole photoshoot together. LOL. Either way, it was such a great way to kick off that in between week that you just don’t know what to do with yourself. The camera settings for this image is F8 at 1/200th of a second and ISO 500 with my Sony A7II and 16-35mm lens. Monday mornings. Usually people dread it. Me, I love them. I love what I do and when weekend plans don’t get in the way of doing what I love, I can’t help but welcome the day with open arms. Although this past Monday started superrr early. I’m talking 3a wake up call. Y’all know me and how I’m a morning person, but I’m also a person who likes to sleep through the whole night. LOL. My friend, Larry, told me he was going to go to the National Mall to try to capture the super moon setting, so I had to get up and join him. The moon was alright, but the sunrise was amazing! 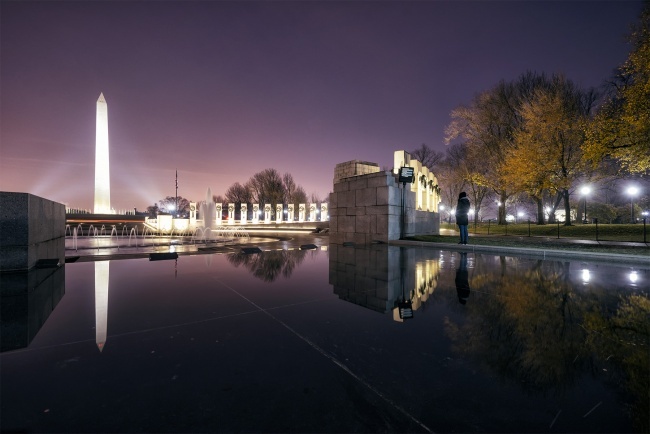 So we met up by the WWII memorial and had plans of capturing the super moon over the Lincoln Memorial and use the Reflecting Pool for the reflection of it all. What’s better than a super moon image? 2 super moons in one shot! I still think the images turned out pretty good, but while we were waiting for the moon to set, we started to play around with different images and angles. So for this image, I set up the shot, Larry helped me by hitting the trigger and our friend, Dave helped out by lighting me up. It was totally a group effort and am so happy with the way it turned out. Thanks guys for all your help! Super moon shoot was fun, but I think I’ll just stick to sunrise next time 🙂 Or just capture the moon it as it rises. I was definietly feeling the effects of an early wake up by 9am. At that time, I had already been up for 6 hours! Craziness! The settings for this image is F5.6 at 4 seconds and ISO 500 with my Sony A7II and 16-35mm wide angle lens. Arrived into Dulles airport real late last night and went straight to bed. Today I plan on catching up on a lot of emails, laundry and image editing. Any image or place you want to see in particular? I’m taking requests. LOL. Can’t wait to start diving in to these photos. Only problem is that I took so many pictures that it’s hard to figure out where to start! Its a good problem I guess 🙂 More stories about our road trip as the blog posts start rolling out and there will be a youtube video! But it feels so good to be home. In general, many people ask me for my secret shooting location or favorite spot to shoot in DC. It’s hard to say. But what’s easy to say is my favorite parking spot. 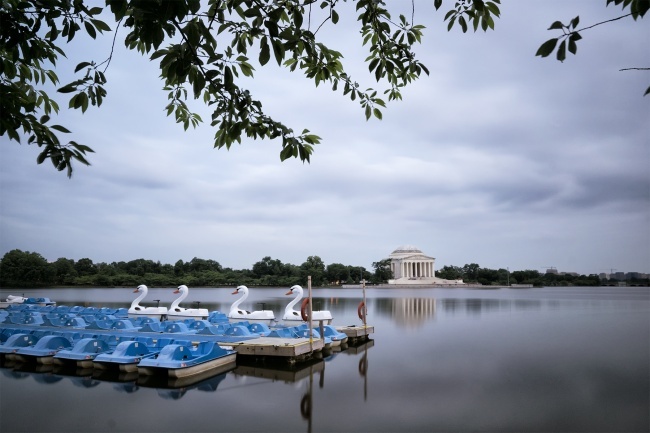 It’s 100% the paddle boat parking lot at the Tidal Basin, as seen on this map. It is by far the most centrally located parking space to all the monuments, but for some reason hardly anyone parks here. Theres always plenty of parking whenever I go. Plus it’s freeeee! The only down side to this parking lot is that it’s closed during Cherry Blossom season. 2 weeks out of the year? No big deal. I’ll take it! Even if you’re feeling a bit lazy and don’t want to leave the parking lot, you get some beautiful views like this one. I love these new swan paddle boats. They make things so much more interesting. I shot this with my fav, Ice Neutral Density Filter 10stop to get that silky smoother water. My camera settings for this image was F7.1 at 25 seconds at ISO 500 on a tripod on a super cloudy but beautiful evening. Starting tomorrow will be images from our trip! Can’t wait to share with you! EEEKKKKKKKK.